It’s coming up for Another’s half birthday at the end of this month. I know,right? It’s been a whirlwind and a great one at that. More importantly, I’ve survived. While quitting the day job is a scary prospect for many, myself included, it doesn’t have to be impossible. How do I take care of my accounts, taxes and all that jazz? Where do I find new clients? Will I go stir crazy working on my own? There’s an answer to nearly every question you can think of. But here’s a few things I’ve learnt in my first 6 months (ish) of being a freelance web designer. Seriously, it’s cheesy but ‘tax doesn’t have to be taxing’, and the same can be said for accounts. As a web designer keeping on top of the accounting isn’t as complicated as some professions, there are very few overheads to think about. As long as you’re organised, keep track of all money coming in and going out, get receipts for EVERYTHING, make a note of any work related mileage, and be nice to your clients so they pay you on time it’s nothing to be scared of. While it does happen, it’s not as common as you might fear. But be smart. Personally I take a deposit before starting any work, with the balance to be paid when a project is complete. I’ve had a couple of clients innocently forget to pay before the due date, they received a gentle reminder email where I explain how important it is for me to be paid on time. In both instances I’ve had a phone call the same day to apologise and they’ve paid immediately. What about actual tax, self assessment and NI? Being self employed I have the fun task of filling my self assessment. By keeping on top of my accounts throughout the year – little and often is my preferred method – filling out the SA is a painless process. If you’re in any doubt about expenses you can claim, what NI contributions you need to make and anything else tax related I found the HMRC webinars to be a great resource for information. 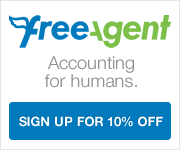 I use accounting software, Freeagent*. It’s a subscription based service but at around £16 a month it saves me a heap of time and everything is in one place. I use it to send my invoices, keep track of overdue invoices and any expenses, as well as time tracking for ongoing projects. * It’s not a sales pitch but that link right there will get you (and myself as a referrer) 10% off the monthly subscription. They also do a free trial. The scary part of this is it’s month on month. By giving up a salary there is no guarantee I’ll make money every month. I have two words – marketing and networking – in equal and large measures. The first hurdle was coming up with a brand, while I’m a freelancer I decided to trade under the name Another rather than my own name. My main reason is there are quite a few Gemma Harris’ about – I even went to school with one, they put us in the same class, confusing much. Then the next step was the website, the SEO and the supporting documents. All part of the marketing. I’ve learnt a few tricks over the years as a web designer so it was about putting what I know to good use on my own website. In my first 6 months (ish) I’ve been very fortunate in that I haven’t needed to spend any hard cash on advertising, unless you count the business cards I got from moo.com*. I’ve found self promotion, selling yourself to friends, family, previous employers, colleagues or anybody that will listen goes a long way. And yes, this includes the old man that props up the bar at your local. To start with, the idea of ‘selling myself’ was something I would grimace at, but then I realised that it essentially involved talking about what I enjoy, web design, describing my processes and my work. If potential clients can see your passion they’ll know you’ll do a good job. It’s not all about directly targeting clients though, some of the best conversations and leads have come from peers. * Again, it’s not a sales pitch but the quality of moo business cards are pretty great. That link right there will get you 10% off your first order, and I’ll get a little off my next order too. All I can say is not yet. And as weird as it sounds I never really feel completely on my own. The web community is vast and very welcoming, they’re a social bunch and in-between client work you’ll find them on twitter, writing articles and sharing their experiences. They’re real people too, you can meet them at networking events and such like. I go along to Second Wednesdays which is a great local event for web related folk to meet, network and listen to speakers talk about what they know best. It doesn’t hurt that you also get a couple of free drinks to get the conversation going! While it was a daunting decision and one of the hardest I’ve made it’s probably one of the best. I’ve learnt a lot about running a business, about myself and about the industry I work in. I’m more than happy to share any advice to anyone that’s thinking of becoming a freelance web designer, I’m no oracle, I just know what works for me. And lastly a big thanks! To everyone that’s got me through the last 6 (ish) months. Friends, family, clients and peers. Here’s to the next 6 (ish) months!! This entry was posted in Personal on July 10, 2013 by anothergemma. It’s my background, ambitions and outlooks. It’s web design tips and advice. It’s problem solving and business anecdotes. It’s my freelance journey and this is the obligatory first post. Welcome, hello and how do you do. I’m a freelance web designer based in Nottingham, England. I have a passion for the Internet, for designing and exploring. Prior to starting my freelance studio, Another, I was a key player in establishing a digital design agency where I gained 5 years experience of the web design industry. I use my experience to work with individuals and companies who want to make the most of their online ‘home’, whether they’re new to digital or looking to revive a previous attempt. I listen, research and recommend, I draft, design and build, I manage, market and maintain. And more besides. This entry was posted in Personal, Web Design on March 4, 2013 by anothergemma.